Commanding the center of the heavens, overturning the axis of the earth; capturing the tiger, distinguishing the dragon from the snake: displaying such abilities, one can for the first time be called active and enlightened. And then words can meet words, spirit meet spirit. Tell me, who has ever been like that? See the following. Yangshan asked Sansheng, "What's your name?" Sansheng said, "Huiji" [Yangshan's Buddhist name; it means "wisdom silence."]. Yangshan said, "Huiji -- that's me." Sansheng said, "My name is Huiran" [Sansheng's Buddhist name; it means "kindness"]. Both grasping, both releasing -- what fellows! Both gather in, both let go -- which is fundamental? Riding the tiger -- marvelous skill! Riding a tiger always demands absolute competence. The laughter ends, traceless they go. When the laughter ends, who knows where it's gone? Infinite pathos, to think of them! It will only stir the wind of lament for all time. When Sansheng arrived at Mount De, he started to arrange his zazen items when Deshan said, "Don't put out your meal apron. There's no rice here." Sansheng said, "Although it's here, it can't be shown." Deshan took his staff and made to strike Sansheng. Sansheng grabbed it and pushed Deshan onto the meditation platform. Deshan laughed loudly. Sansheng shouted and went out. As Xuefeng was going to the temple manor, on the way he encountered some macaques, whereupon he said, "Each of the macaques is wearing an ancient mirror." Sansheng said, "For eons it has been nameless; why do you depict it as an ancient mirror?" Xuefeng said, "A flaw has been created." Sansheng said, "The teacher of fifteen hundred people does not even know what to say." Xuefeng said, "My fault. My tasks as abbot are many." During the time that Sansheng was with Yangshan, one day an official came to call on Yangshan. Yangshan asked him, "What is your official position?" He said, "I am a judge." Yangshan riased his whisk and said, "And can you judge this?" The official was speechless. All the people of the community made comments but none accorded with Yangshan's idea. At that time, Sansheng was sick and staying in the infirmary ["Life-Prolonging Hall"]. Yangshan ordered his attendant to take these words and ask Sansheng about them. Sansheng said, "The Master has a problem." Yangshan again ordered his attendant to ask, "What is the problem?" Sansheng said, "A second offense is not permitted." Yangshan deeply approved of this. Baizhang had formerly imparted his meditation brace and cushion to Huangbo, and had bequeathed his staff and whisk to Guishan. Guishan later gave them to Yangshan. Since Yangshan greatly approved of Sansheng, when the day arrived when Sansheng was taking his leave and departing, Yangshan took the staff and whisk to hand them over to Sansheng. Sansheng said, "I already have a teacher." Yangshan inquired into his reason for saying this, and the reason was that Sansheng was a true heir of Linji. In asking Sansheng's name, Yangshan ignored both the name and the reality. Sansheng said, "Huiji." See how a man who has the eye is naturally not the same as others. This manner of Sansheng's was still not crazy, though; he simply captured the flag and stole the drum. See how those men of old contemplated the Path like this: they exerted their spirits to the utmost, and only then were capable of great enlightenment. Yangshan said, "I am Huiji." This is where he let go. Sansheng said, "My name is Huiran." This too is letting go. Yangshan laughed heartily. Because he was crystal clear in every respect, therefore he functioned with complete freedom. This laugh was not the same as Yantou's; in Yantou's laugh there was poison, but in this laugh, for all eternity the pure wind blows chill. Even if you are a long-time practitioner, if you get confused you can't hear. "What is your name?" This is holding still. Sansheng said, "Huiji." Holding still, he won't let it be said it is not Huiji. "Huiji is me." This is letting go. Sansheng said, "My name is Huiran." "If you're Huiji, then I'm Huiran!" They took turns occupying the fundamental and extending their hands, obliterating both guest and host. Relative and absolute interchanging, letting go and gathering in were both total. When you have reached the state beyond effort, there will be no one to recognize it through the ages. Even though Yangshan knew Sansheng's name, he asked the question to test the other's penetration. This is a method of letting go. Because Sansheng was an adept, he didn't say his own name but pretended to be drunk on tea and tossed out a substitute. This too is letting go. Yangshan replies, "What you said is my name." Suddenly, he is holding still. Sansheng says, "Then I'm Huiran," suddenly wrapping it all up, also a method of holding still. Observe the action in an interchange of adepts: there is nothing about Buddhism in it; it is the realm of "after enlightenment being the same as before enlightenment," a completely inviolable state. Yangshan roared with laughter. Throughout all time the pure wind is severely cold. What a pleasant laugh! 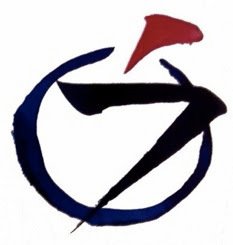 This is the eye of Zen, the handle of Zen practitioners. When Sansheng was asked what his name was, he replied by giving the name of his questioner. When the questioner rebuked him he instantly gave his own name. From whichever point of view -- the negative or positive methods of instruction -- the reply was apt and prompt. Sansheng was indeed a strong man who could answer and act quickly. He was a strong and supernormal man who knew how to get on the back of a tiger. But what about Yangshan's roar of laughter at his friend's answer? That roar of laughter died out in thin air. How far did it go? It will go on for a thousand ages. It will be like a lonely autumn wind -- for ever the despair of all who hear it. The exchange seems to have taken place when Sansheng first visited Yangshan. Yangshan must long have been familiar with Sansheng's name, but he pretended not to know it. By ignoring Sansheng's name, Yangshan deprived Sansheng of his name and reality. Sansheng said, "Huiji!" This was Yangshan's personal name. In other words, if you deprive me of my name, I shall deprive you of yours. Yangshan said, "Huiji is my name!" In holding fast, or grasping, the whole universe vanishes. In letting go, or releasing, the individual world appears, in which everyone asserts his existence. When he asked his first question, Yangshan was standing in the absolute world, where others are ignored. But now he has come out into the world where everyone has his name, and he has himself confirmed his own name. Sansheng said, "My name is Huiran." All right, if you come out into the world and confirm yourself, I shall do the same. Of course, the two masters' actions were not the outcome of this sort of intellectual reasoning but flowed from an intuitive understanding. Yangshan laughed heartily. Yangshan found that his words were met by Sansheng's, and so was his spirit. And quite naturally, he laughed delightedly. Sansheng was Linji's most outstanding student and a very great Zen man. When he went out on Zen pilgrimage and entered into exchanges with various Zen masters to sharpen his enlightened understanding, Yangshan was one of the people he visited. Yangshan undoubtedly knew Sansheng's name since Sansheng was well known by that time, having made quite a name for himself as he traveled from temple to temple. Since Sansheng was supposed to be quite a fellow, Yangshan deliberately pretended that he didn’t know the name of his guest, because he wanted to check him by seeing how he responded. Sansheng replied, “Huiji.” A very interesting reply. Imagine if someone came to me and, upon my asking his name, he were to say, “Kyôzô Yamada.” Just what is going on here? We can understand this using the fraction I always cite as an example where the denominator is zero-and-infinite (satori is coming to a realization of this denominator) and the numerator (α) is anything at all. Let’s say the denominator in this case is the person called Yangshan Huiji. With Sansheng's answer, Yangshan disappears completely. The numerator which is Yangshan Huiji has completely disappeared, and all that remains is the empty and infinite denominator. This has been expressed in various ways in Zen literature. For example, to erase the numerator is known as shû or “gathering in” or datsu [“stealing”] or setsu [“killing”]. All that remains is the empty and infinite denominator. In response, Yangshan says, “Huiji -- that's me.” With this, the numerator comes to life. This is hô [“letting go”] or yo [“giving”] or katsu [“giving life”]. This time Sansheng says, “My name is Huiran,” thus saying his own name. Once again, with this reply, the world of the numerator comes to life. Yangshan laughed loudly. With this laughter, Yangshan realizes that Sansheng’s ability is on a level with his own and is delighted. 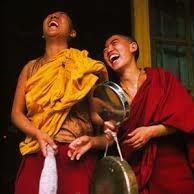 His laughter is one of boundless and bright joy. My name is your name. It was never described until now. Stir the wind of lament, laugh the poison laugh. His laughter ends, I know not where he's gone. I do not even know what to call him.